What a Crock! Easy Tips for Crockery Cooking | Cheap Eats! When I think of crockery cooking, I always see in my mind’s eye, my mother’s old avocado-green crock sitting on our turquoise and white 1960’s kitchen counter. What a thing of a beauty it was … NOT! But today’s crockery cookers are sleek, modern appliances you don’t have to hide away in the dark recesses of the pantry or garage anymore. 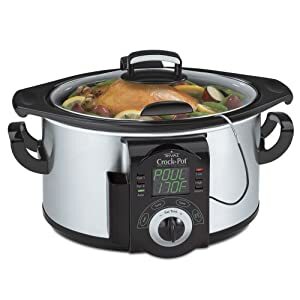 If you like the experience of walking in the door and smelling dinner cooking without you slaving away in the kitchen preparing the meal, you’ll love the convenience of a crockery cooker. Take a few minutes in the morning before work or school to throw some ingredients into the pot, set it and forget it. When you come home at dinnertime, you’ll be greeted by the heavenly aroma of an easy dinner. What could be better than that? At the end of the day when I’m tired and ready to put my feet up, the last thing I want to do is dive into a bunch of meal preparation work. But in the morning, I’m refreshed and able to put more energy into food prep. But even then, it’s not much food prep. Maybe a bit of chopping and browning, but no more than ten or fifteen minutes worth of work, at the most. Choose a crock with a removable liner. You’ll have more flexiblility in ways to use it, and it’s easier to clean. Best if used for recipes with a high water content – things you’d normally prepare on the stovetop such as spaghetti, soup, chili, stew. For best results, fill the crock at least half full with food and/or liquid. If you’re cooking something like a stew or soup, leave at least an inch (preferably two inches) empty at the top beneath the lid to allow for the food to bubble when it reaches a simmer. Don’t peek! Lifting the lid adds time to the cooking process by letting heat out. Add 15-20 minutes to the cooking time for every time you lift the lid to peek or stir. High altitudes need longer cooking times. Check with your crock’s Manufacturer’s User’s Guide for their recommendations. Brown meats ahead of time for additional color and flavor. Browning also removes some of the fat from the meat. Fatty meat cooks more quickly in the crock than lean meat. Meat and poultry cooks best if cut into smaller pieces or chunks rather than cooking as a whole roast or a whole chicken. Fish and seafood should be added near the end of the cooking time in seafood soups, stews and chowders. Vegetables such as carrots and potatoes, should be added to the bottom of the crock beneath any meats, etc. Hard vegetablees need a longer cooking time, and the bottom is the first part of the cooker to heat up, so they’ll start cooking sooner. Stir in cheese at the end of cooking, or use processed cheese. Milk curdles during long cooking times. Add milk near end of cooking time (the last hour, or so). Add spices near the end of the cooking time. Stirring usually isn’t required during slow cooking on Low heat. You might want to stir once or twice during the last hour, but remember that every time you lift the lid, you’re adding to the cooking time. Two stirring sessions equal a minimum of half an hour longer cooking. Use fresh or completely thawed meats. Don’t add frozen meats directly to the crock. Be sure the crock is clean before using. Keep perishable foods refrigerated until ready to use. Always include liquids in all crockery cooking recipes. Remove the cover by opening away from your face. The steam is hot enough to burn badly. Don’t leave the cooker turned off with food in it for any length of time. Start cooking right away, and serve hot from the cooker. Don’t let food sit at room temperature to cool. Keep the crock covered while cooking. The lid on a crock doesn’t provide a tight seal (it isn’t suppose to), but it’s important to keep the lid in the center of the crock for best results. Don’t set the hot crock on a cold surface unless you put a hot pad, trivet or towel underneath. If the power goes out while you’re away from home with the crock running, throw the food away even if it looks hot and done. The power might have been off long enough for the food to cool, start growing bacteria, and then reheat by the time you arrived home. Don’t reheat leftovers in a crock, but you can use the crock as a food warmer for foods that have been cooked and heated in the oven or on the stovetop.